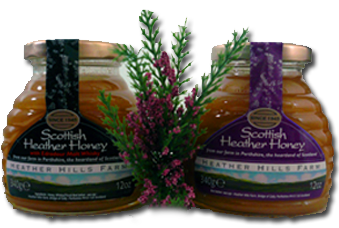 Established in 1945, Heather Hills Farm is a traditional family-run honey farm based in the Highlands of Perthshire - the heartland of Scotland. We specialise in a selection of 100% pure, raw, monofloral and polyfloral honeys and handmade preserves. Starting off with just one hive in 1945, we now have 1300 hives across Perthshire and Deeside - the most beautiful and unpolluted parts of the UK. This relatively small-scale ensures our hives are regularly and well spaced out in small batches by zones. This means that the bees have plenty of opportunity to roam - up to a 5 mile radius of each hive - giving a superior quality product. A bigger producer would normally cram around 100 hives into the same space – this reducing the quality of the product. In an age of mass production and bulk processing, our honey is collected and extracted using traditional methods to ensure that the enzymes, protein and natural goodness of our honey stays within it and are not destroyed during the harvesting, separating or bottling processes.This produces artisan, raw honeys of a far superior quality and distinctive flavour which retain their natural benefits. In wine terms, our award-winning Scottish Heather Honey is the Champagne of Honeys due to the geographical location of our hives, the terrain and the climate. To complement our Scottish Honey Range, we also do a selection of 100% pure, raw, monofloral honeys specifically selected from around the world by our Honey Sommelier for their own unique flavour and texture. Our award-winning Scottish preserves are extra fruit jams made with local Perthshire fruit and cane sugar. Produced in small batches by hand, they contain no artificial flavours or preservatives. We believe you deserve the best in honey and preserves - since 1945. Have a look at our new cosmetic range made with our hive products. A Glasgow University report has found that Scottish Heather Honey was among several honey brands that proved to be just as effective as Manuka Honey. Used in healing treatments worldwide, Manuka has been praised for its antibacterial properties but results of the study show that whilst Manuka is very effective, heather honey works just as well at fighting bacteria in wounds. We are delighted to announce the new listing of our Great Taste 2017 award-winning Scottish Marmalade with Heather Honey with Waitrose Scotland this month.Adding to our current 8 listings from our Scottish honeys and preserves range with all 7 of the premium supermarket’s Scottish stores, the 340g jar is our latest addition to their range and builds on our brand’s reputation for producing in ternationally recognised award-winning products that represent the best of Scottish provenance. Great Taste, the world’s most coveted food awards, which celebrates the very best in food and drink, announced the Great Taste stars of 2017. Out of over 12,300 products to be judged, Heather Hills Farm was one of only two Scottish artisans to scoop a Great Taste Top 50 Foods in the World accolade for our 3-star award-winning Raw Tasmanian Leatherwood Honey, together with 1-star awards for our Scottish Heather Honey with Whisky and handcrafted Scottish Marmalade with Heather Honey.